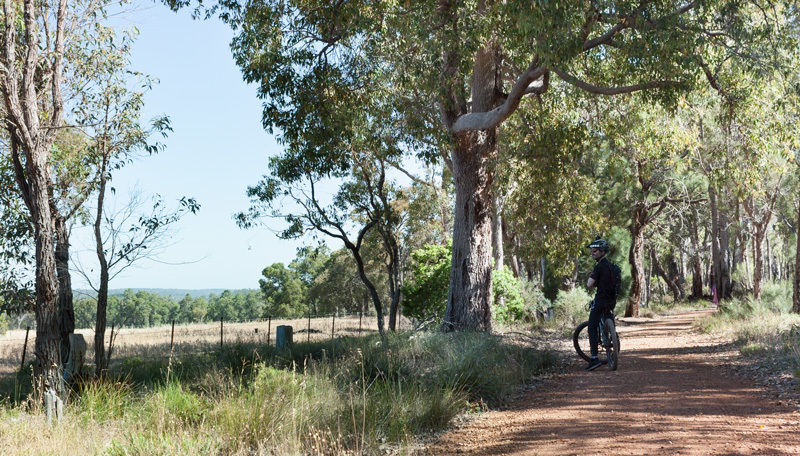 Easing our way into a summer of riding, we embarked on a fun cycle to Lake Leschenaultia using the mountain bike trail network from Mundaring. 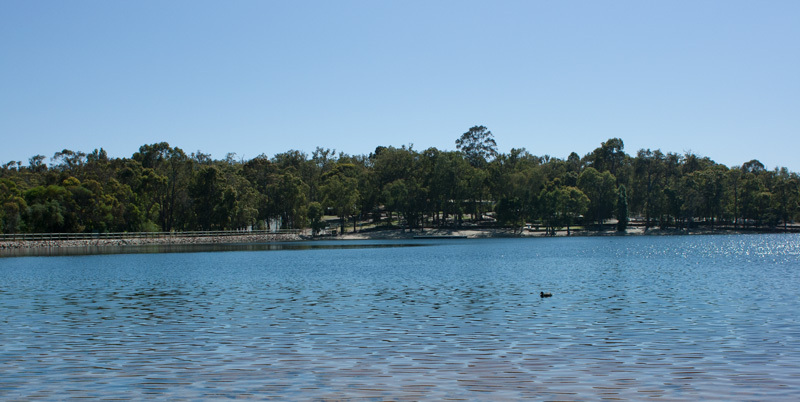 Lake Leschenaultia is a man made lake set in native West Australian bush land with camping and recreational facilities. Interestingly the lake was built in 1897 as a dam called Chidlows Well, for maintaining the steam engine trains that ran along the Eastern railway between Fremantle and Northam. 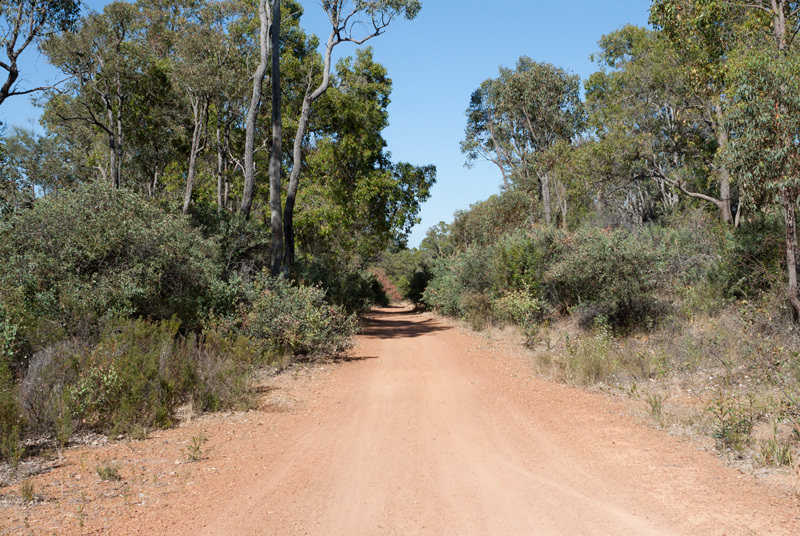 The route from Midland to Northam has long since been retired as a form of rail transport, however a section of it was re purposed for multi use trails, some of which we are travelling on during this ride. Unloading the bikes from the car at Mundaring Sculpture Park, a cold breeze in the Perth hills town gives us goose bumps and we are eager to begin so that we can warm up. Later on in the day I’ll be yearning for that cold breeze. 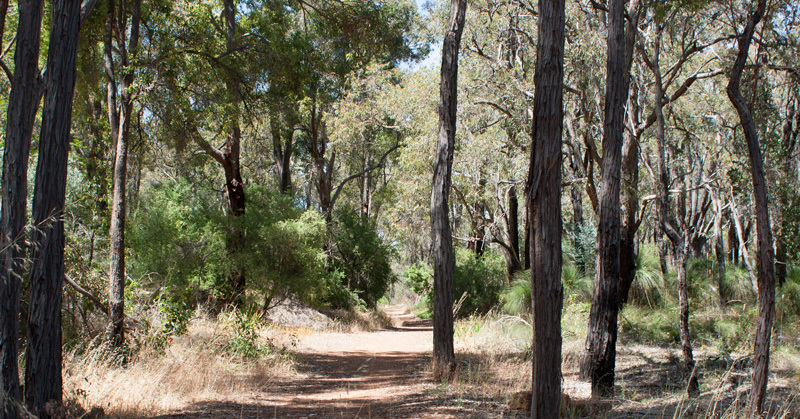 We roll out of the park in the direction of Mount Helena on the Kep Track and Railway Reserves Heritage Trail. 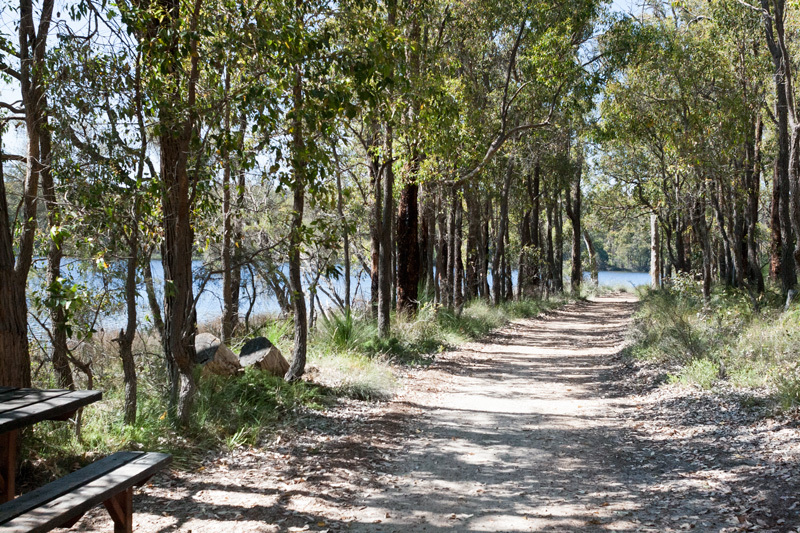 The multi use trail is framed by a natural bush corridor as it cuts through the suburbs of the Perth hills. It’s a unique idea in the residential areas of Perth that not only makes a great cycle path, it gives the local wildlife like Kangaroos an area to move around. 1.5 kilometres into the ride we cross the busy Great Eastern Highway carefully and quite easily. Under the cover of trees our ride is a gentle climb around the Sawyers Valley area before we enjoy a pleasant downward slope all the way to Mt Helena. There are a few road crossings that come up quite quickly in this direction because of the speed we are travelling at. Be mindful with the ground, sudden breaking can result in sliding onto the road, if you are travelling fast though. We reach Mt Helena at a T Junction marked with trail signage. 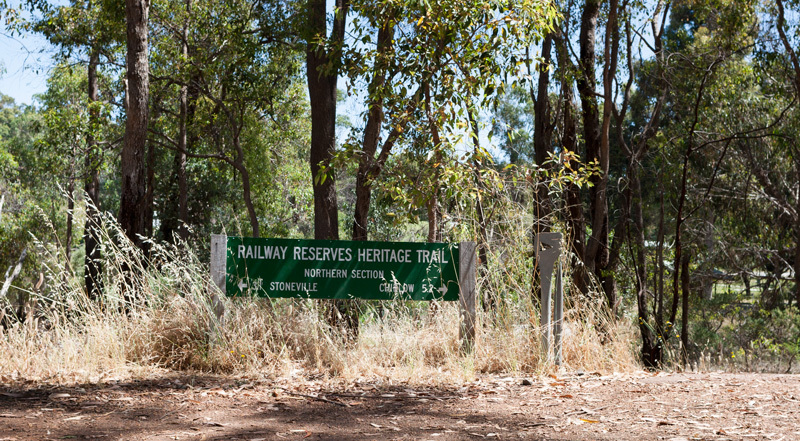 Left, the Railway Reserves Heritage Trail continues a loop back to Mundaring Sculpture Park and right the Kep Track extends all the way to Northam, some 75 kms away. 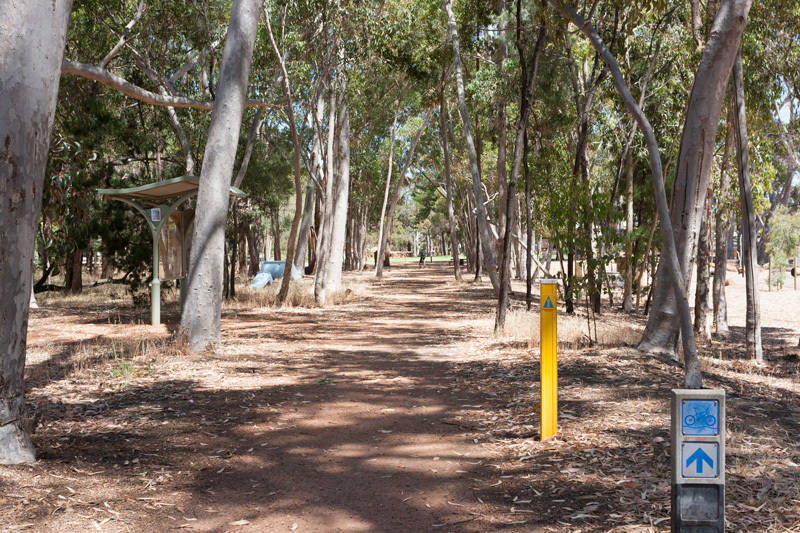 As our destination is Lake Leschenaultia, we turn right navigating a quick cross of Sawyers Road joining the track on the other side of the pipeline. We ride on old rail formation and the raised track expends views of the valley below for a while. The riding thus far is really relaxed and there is ample chance to enjoy the surroundings, this is my kind of trail. Derek on the other hand seeks a few jump opportunities along the way when he spots small raised sections to the side of the trail including newish looking dirt jumps before coming up to Mt Helena. Having spent the past two weeks visiting the Goat Farm MTB Park, this morning was my turn to pick a ride and with that it’s normally a cross country to a point of interest. We are able to ride side by side along the straight trail and we can see metres of trail unfold in front of us. Two older gentlemen approaching in the opposite direction pass by and we exchange happy hellos, they are the only cyclists we will see on the trail. 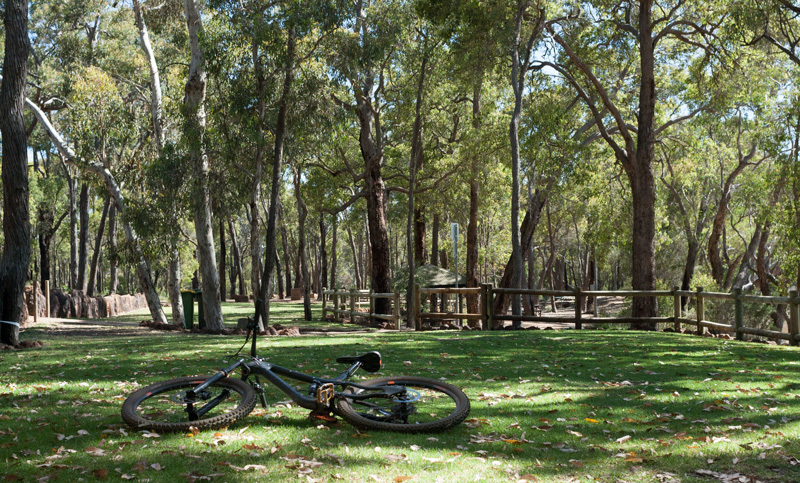 Day 2 of Perth’s summer season and the trail terrain has changed since our winter riding days. The moisture has dried up the ground revealing loose dusty pea gravel, which in turn adds more of a physical challenge as we cycle. Long Rides Bike has a entertaining write up about Western Australia’s pea gravel here. We stick to following the well ridden tyre marks which seems to be the hardest surface and easiest way to cycle on the trail. I encounter a bike wobble moment when I foolishly try to move to a hard surface on the opposite side of where I’m riding, midway downhill at speed, in a heavy pea gravel rut. It’s a high five feeling having evaded coming off the bike. 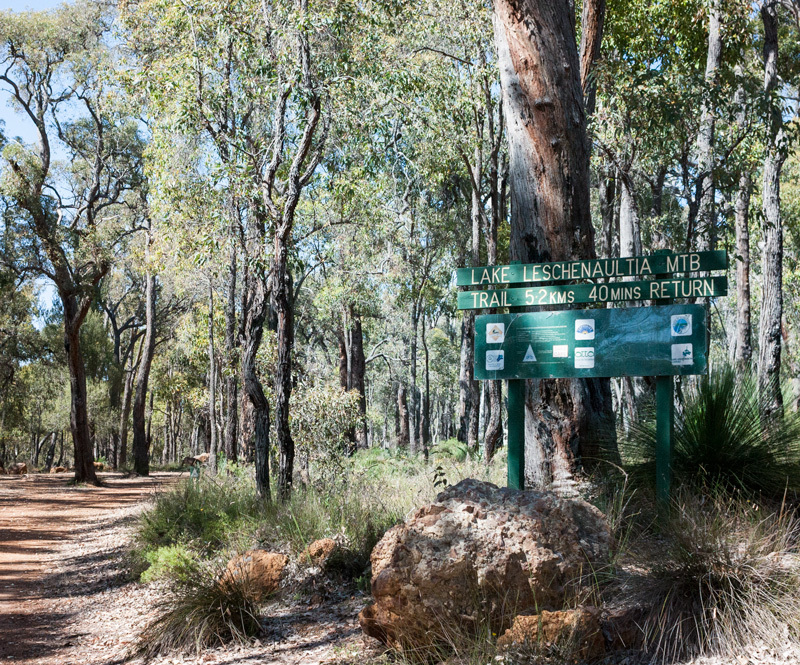 Just before the Kep track curves to cross Thomas road, we spot a small trail marker for Lake Leschenaultia and veer left. When I mapped the ride back at home, I was questioning the route into Lake Leschenaultia as it utilised two sealed roads further away, so I was super happy when we spotted this marker and bypassed the sealed roads effectively shorting the distance as well. Another high five feeling. 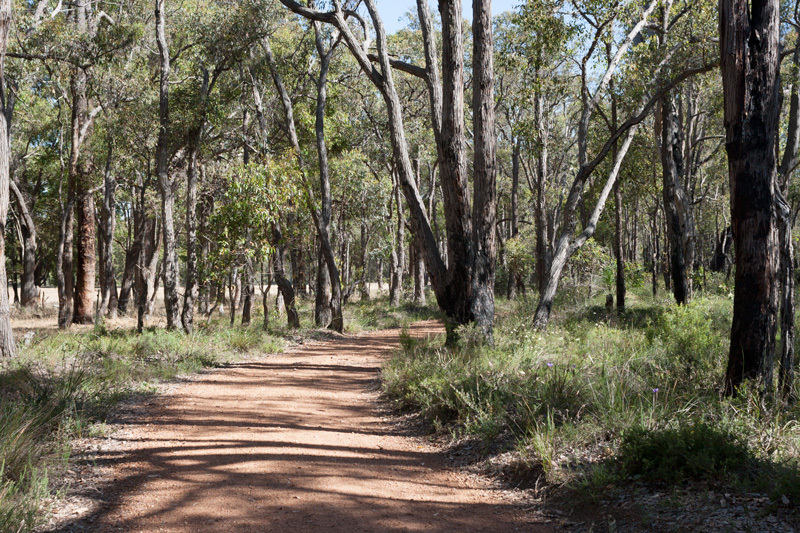 The trail runs parallel to Reservoir Road, enclosed in some beautiful mature forest on the right and farming paddocks on the left. Reaching the end, we see private property in front of us and to the left is a gate bearing a no cars sign. With no apparent signage to guide us, we enter the gate on the left. Having left the Kep Track a while back, we are cycling further into the bush forest and away from the suburbs, the journey feels special and more of an escape now. When I first began mountain biking, I have to confess my small fear of being surrounded by bush. Silly I know. Nowadays, I keenly seek what I was once hesitant of. In the distance we hear the distinctive loud calls of the Red tailed forest black cockatoo and see many shredded honky nuts on the ground, food the cockatoo loves to eat. By looking at the honky nut we can confirm that it’s the red tailed forest black cockatoo because they make a bit of a mess of the nut by removing the top. 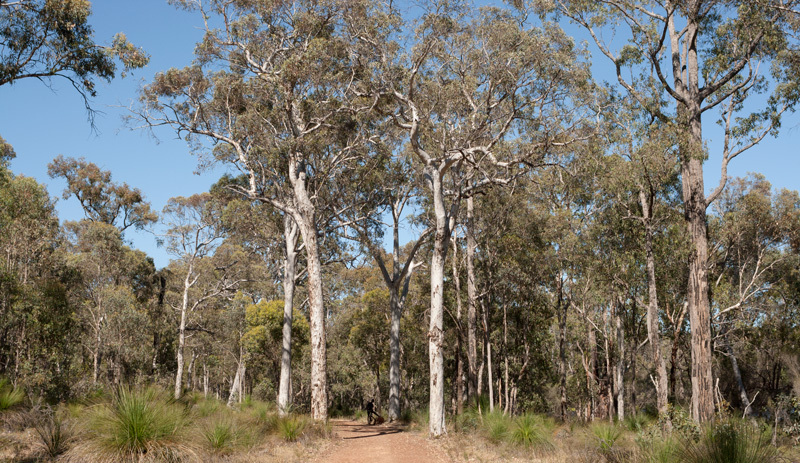 On the outskirts of Lake Leschenaultia the forest is a beautiful hub of mature white gums and marri trees, towering over a healthy understorey of grass trees and bushes. 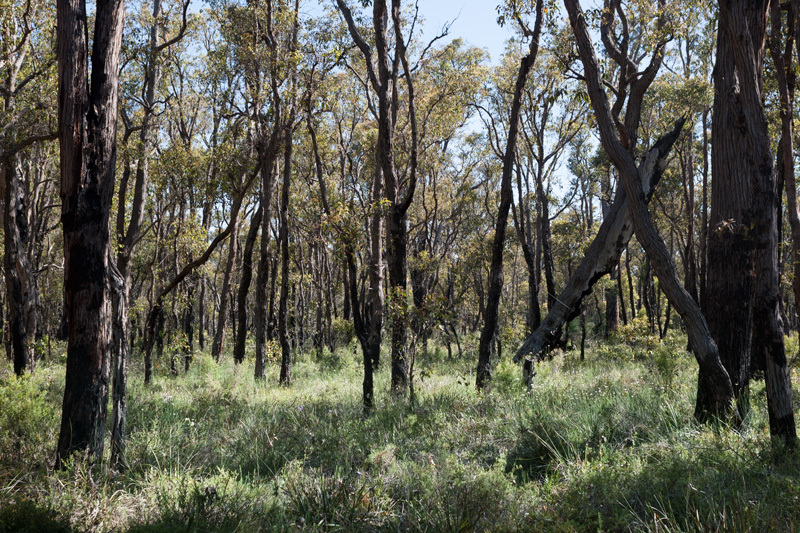 For us it’s an unexpected surprise but shouldn’t be really, because after consulting the internet later in the evening at home, we discovered there is 168 hectares of bush land at Lake Leschenaultia. 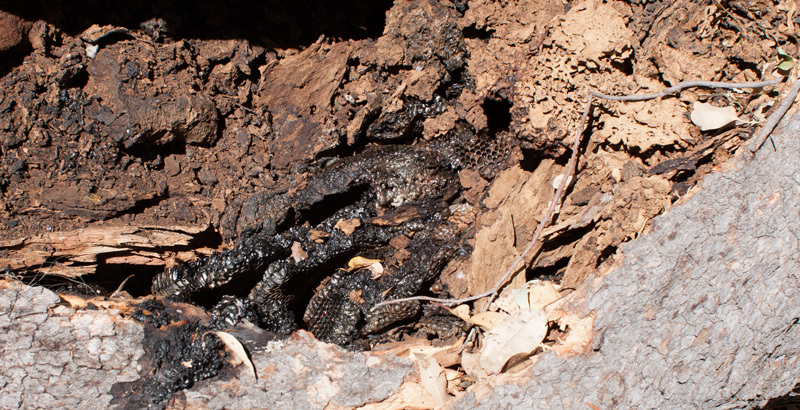 The trail is obstructed by a large fallen marri branch and we spot an old hive once hidden inside the hollow. 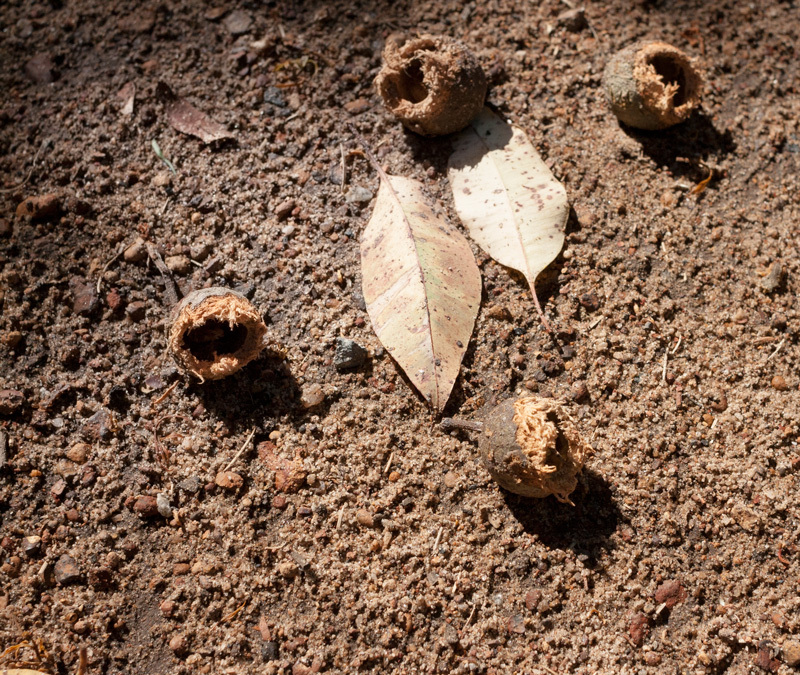 It’s not uncommon for bees to take up hollows that would otherwise be breeding nests for birds. Looks like the bees have moved on. Soon enough we see glimpses of blue and with generated enthusiasm, we pick up the pedalling pace towards the lake. We see a number of smaller trails veering off which may be walking specific ones. 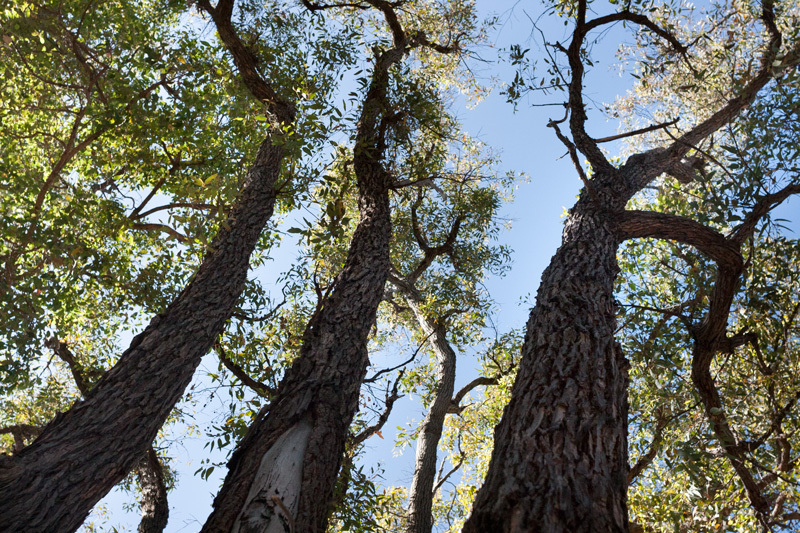 The trees are tall and there are some beautiful paperbark ones very close to the water edge, all benefiting from the water system. We catch up to the cockatoos, now seeing them flying high above. We break at one of the shelters located on the west beach side of the lake. The grass here could rival the Kings Park Botanical Garden lawn areas, it’s a picturesque setting and wonderfully cool by the lake. We have the area to ourselves. I pull out the trail mix balls and we happily finish them off. Behind the picnic shelter area there is a beginner mountain bike trail head – I love the old school signage. Having a return ride ahead of us, we decide to skip it and proceed to check out the main section of the reserve, cycling along the dam wall. In the way of recreational activities, there is camping, canoe hire, a kiosk, BBQ areas and a pontoon on the water. Fun, Fun. Ready to return, we cycle back in the same direction. By now it is mid morning, the wind has subsided and the flies are around, however pedalling they disappear and its enough of an incentive not to stop. The sun is higher in the sky and although the temperature is still under 25 degrees, the trail is heating up and so are we. The bush disperses in some sections and towards Mt Helena we see the road running alongside, we hear two road cyclists chatting just as we are treading pea gravel in an up hill direction. They give us a wave and we return the same. 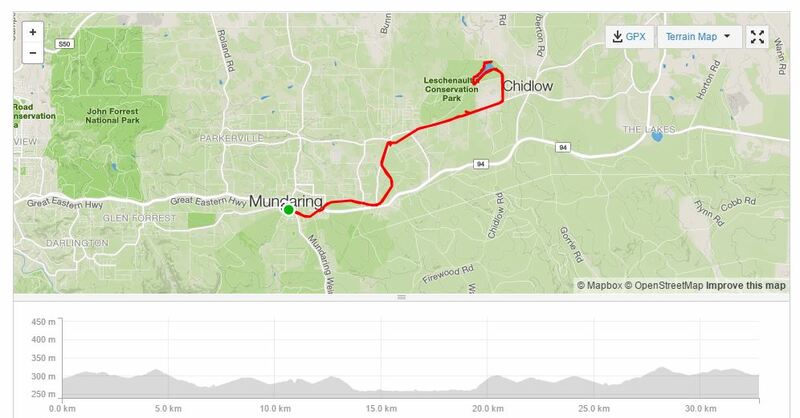 Ideally completing this ride in the warmer months is best done first thing in the morning, there are sections without shade and the return journey entails a bit more uphill riding, albeit it is gentle sloping. 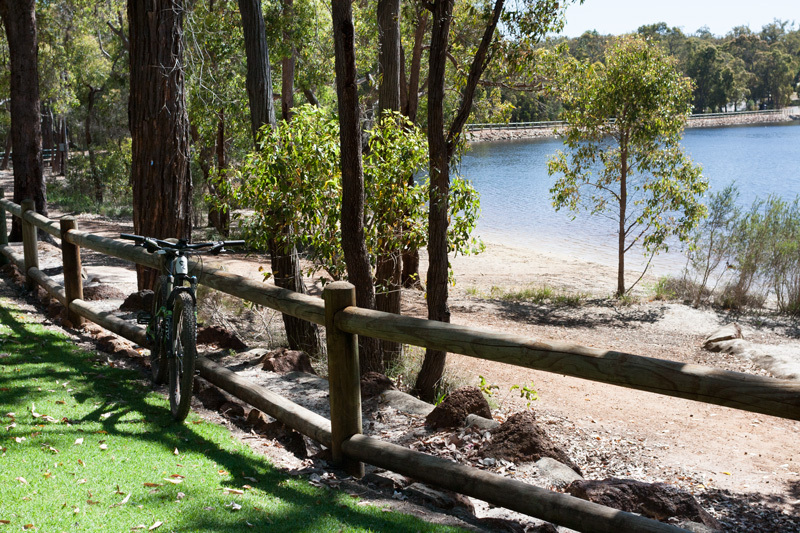 To shorten the ride, have someone drop you off at Mundaring and complete the one way journey, you can afford to leave later on in the day knowing the final destination is a cool lake with perhaps a BBQ and drinks post ride. Neither less it’s been a fantastic morning in the Perth hills on our bikes and we probably will embark on this same ride again soon. How we went on this ride? A social ride with changing scenery and the highlight being cycling the perimeter of Lake Leschenaultia in that beautiful bush land. 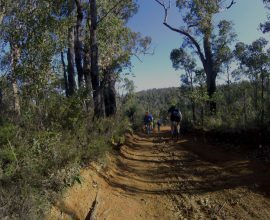 Mundaring is fairly close to Perth and there are so many options in terms of cross country off road cycling, the trails are great for beginners and for covering plenty of kilometres for cyclists that are chasing a bit of endurance. This is a fantastic summer ride because of the easy terrain, lack of remoteness, opportunity to swim at the lake and close proximity to food and drink stops. Summer on the trails is hot and sweaty and at times challenging with the pesky flies and pea gravel terrain. That said, pick a day with a cool morning, start before dawn and it’s a wonderful ride. To avoid heat stroke or illness be prepared with water, regular high energy snacks and protective clothing from the sun. Do you cycle in summer and what’s your favourite route? 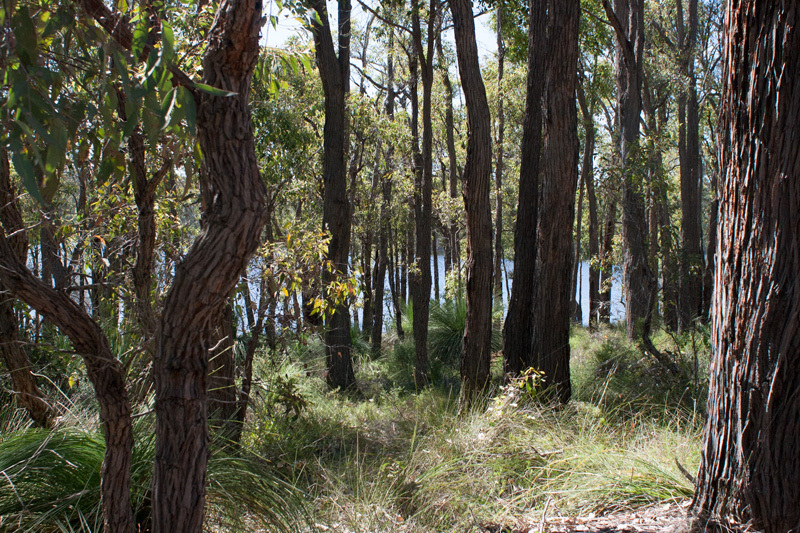 I love Lake Leschenaultia, such a lovely spot to visit. Will have to take the bikes on the next trip.